Great brown bear hunt! After seeing six bears in the first four days of the hunt I took this huge boar. This outfitter runs a great guide service; an honest, hard working guy who takes care of all the details. 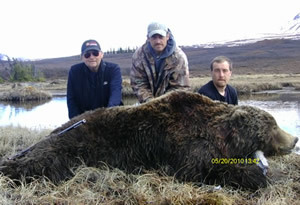 Our hunts for brown bear, grizzly and black bear are conducted in Western Alaska in Game Management Units 17 and 19. Spring bear season is 45 days and the Nushagak drainage has one of the largest populations of moose in the state. Our moose often make the record books with spreads over 65 inches and a few over 70 inches. We have also taken a few bears over 10 feet and a few over 9 ½ feet, but most are in the 8-9 ft range. Our black bears are regularly over 6 ft with a few over 7 ft.
For many years by taking a limited number of hunters we have maintained 90-95% on moose and 90-100% on bears. We have a heavy population of brown / grizzly bear in our area and the most liberal hunting season and bag limit of anywhere in Alaska. Our bear season is open for over 8 months per year, which offers us 3 months of prime bear hunting opportunity. We hunt brown bears in the spring and fall every year, with a limit of 1 bear per year, every year, for non-resident hunters. We are committed to providing top quality hunts with personal service to each client and only take 6-8 bear hunters per spring season, total, and 10-12 in the fall. Our clients are consistently harvesting brown / grizzly bears in the honest 8 ft to 9 ½ ft + range with skull sizes in the 24”- 28”+ range. Over the last decade our historical kill-success rate is 85-100% depend on the year. We take 4-8 moose hunters per year, total. 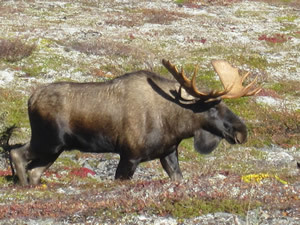 You can book the trip as a moose only hunt or a combination hunt with another species, such as brown bear and black bear. Most folks book the trip as a combo hunt because this is the best value for your dollar. Each hunter, or group of 2 hunters, if booked as a 2x1, hunts exclusively from their own camp for the entire season with no one else hunting that area the same year. Over the past 11+ years we have maintained an impressive 90-95% kill success, with antler sizes vary from 58” to 74”, but with 62” being an average. And best of all I'm proud to say we've made a lot of great friends along the way! In years past, the Mulchatna herd has produced the largest taken in Alaska. In fact, we have the distinction of one of our bow hunters taking the new #1 Pope & Young Velvet Category caribou with an impressive 439 B&C points, and still claims the #1 SCI Velvet Category with a score of 530 points. However, with the herd on the decline in recent years, until we see some decent trophy size bulls again we are temporarily suspending all caribou hunts until further notice. Our hunting area GMU (Game Management Unit) 17, 19, and 13 is home to some of the largest coastal brown bears in the world, massive Alaska moose and large dall sheep. Other species in this area include black bear, wolves, grizzly, wolverine and a number of smaller fur-bearing animals. One outfitter can't offer everything, so we focus on all of our resources into hunting only 5 species: brown bear, grizzly bear, moose, black bear and dall sheep. One area we hunt encompasses a large part of Western Alaska and the Bristol Bay region. This hunting area is HUGE! The southern part of this area starts at the Bristol Bay shoreline and then runs north to the Kilbuck Mountains. The eastern border of this area is the famous Mulchatna river watershed, and then runs west taking in the Nushagak river drainages and Nushagak Hills.This area is about 170 miles long by 90 miles wide, roughly 15,000 square miles! The areas we hunt have lake and river systems in which 4-5 million salmon spawn annually, which is one of the largest concentration of wild salmon spawning anywhere in the world! As hunters know, when you have concentrations of salmon, you'll have concentrations of bears.